Very small grasshopper nymphs were first detected this past week. 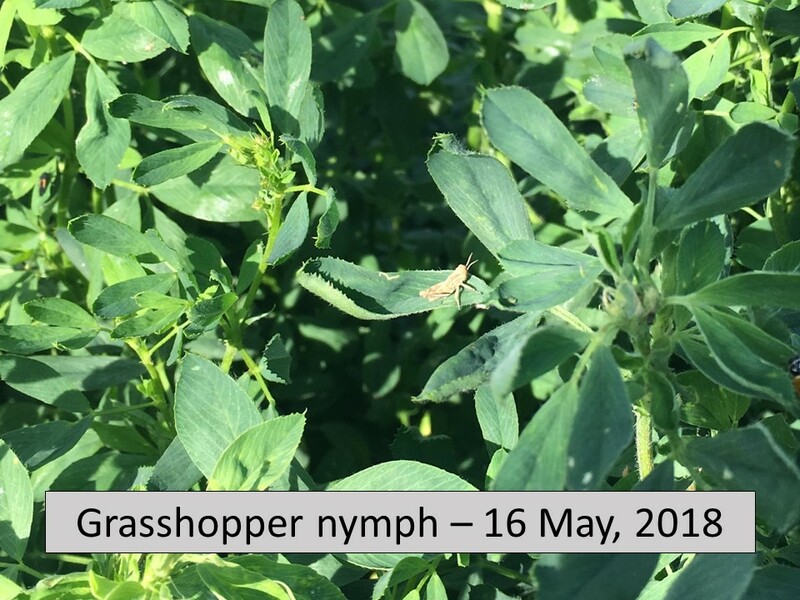 Grassy areas, waterways, and field borders will have the small grasshoppers first and thus should be monitored weekly to determine grasshopper densities. Most alfalfa monitored in north central Kanas in the last week has started flowering and swathing seems to be well underway. 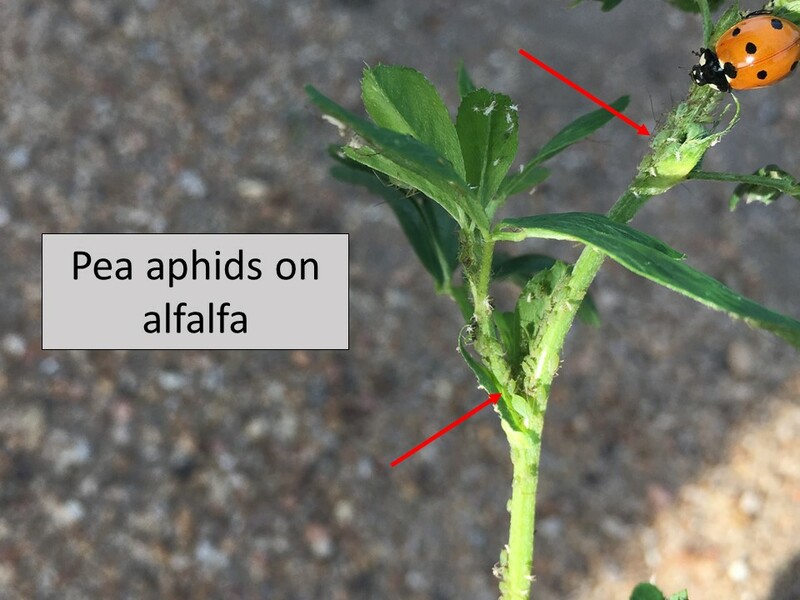 Alfalfa weevil infestations, which we sampled throughout NC KS, never did exceed an overall 30% infestation level (using the cut stem bucket shake method). This year, any time larval numbers started increasing, a sub-freezing cold spell came through and killed many newly hatched larvae. 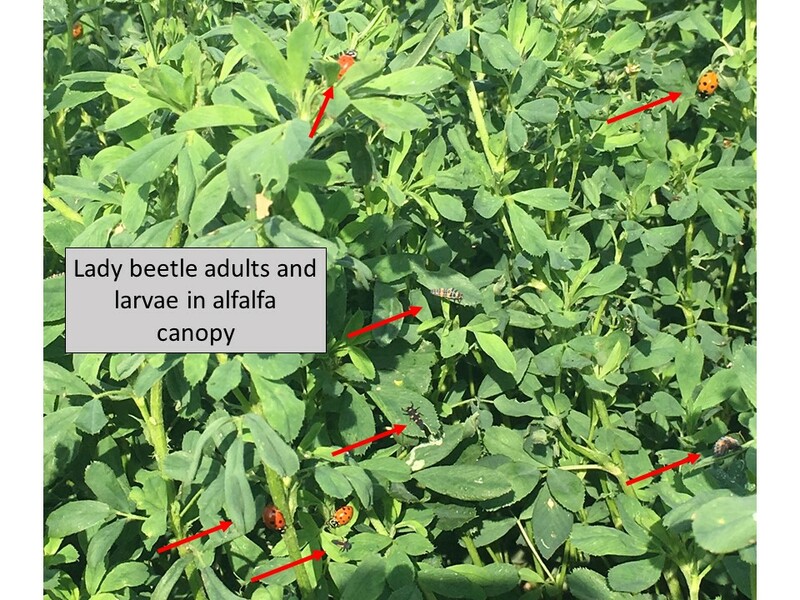 Since alfalfa fields were not treated for alfalfa weevils they are currently a great place for many beneficials. 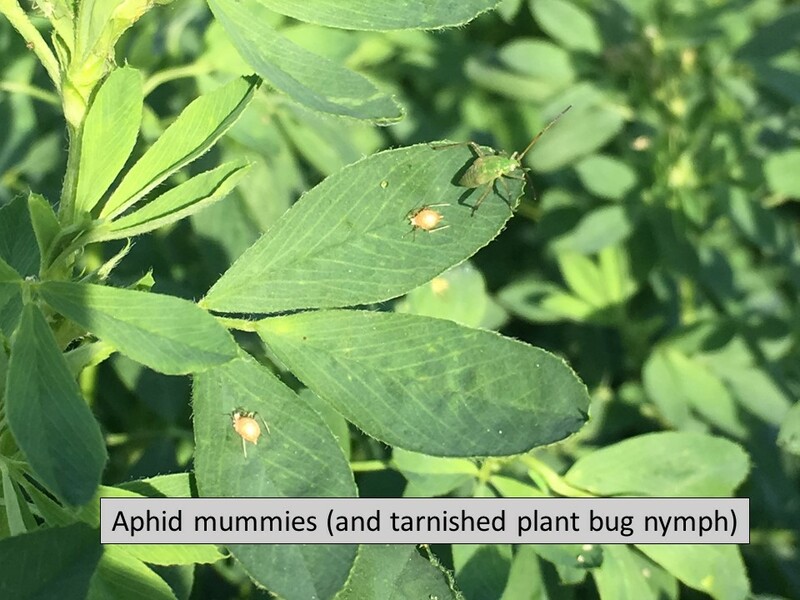 Uncut fields sampled in the last week had healthy populations of pea aphids as well as a few spotted alfalfa aphids. However, as beneficial populations increase, these aphid populations are rapidly declining. 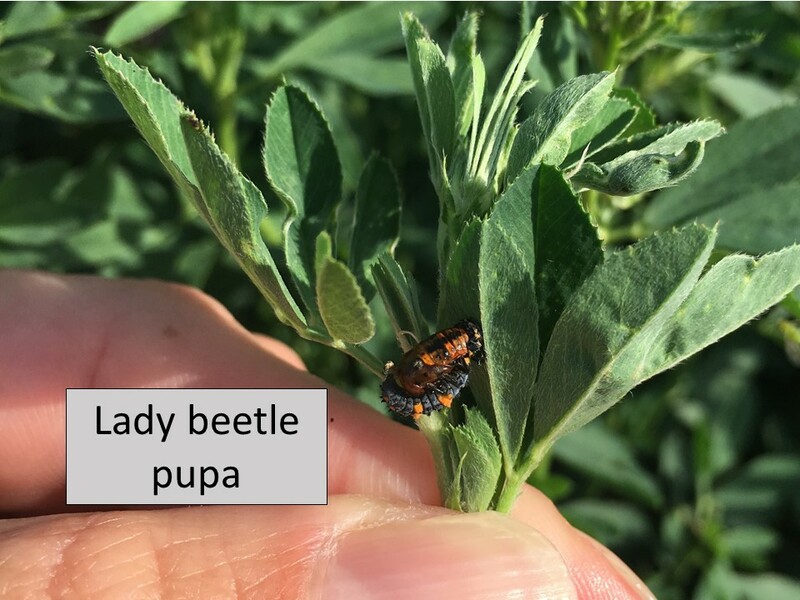 Presently there are many lady beetles, both larvae and adults, and more adults will be active very soon as there are also many pupae. There are also significant numbers of parasitic wasps parasitizing these aphids as indicated by many mummies. In 1982, Stroyan distinguished a subspecies of Metopolophium festucae, sensu stricto, as M. f. cerealium based on morphological characters. Whereas the former subspecies infests various wild grasses and is only incidental on grain crops, the latter is a potentially significant pest of cereals, especially wheat. Although this aphid complex has been present in North America since the 1970s, it was not until 2011 that significant M. f. cerealium infestations of wheat (as well as barley and oats) were discovered in the Pacific Northwest. The winged adults are pale yellowish with dark markings on the dorsal surface (Fig. 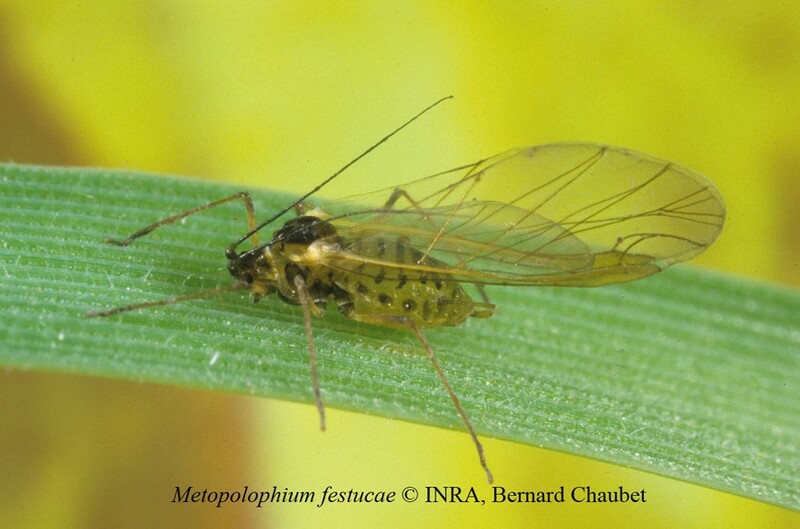 1), whereas apterae are pale yellow, similar in color to sugarcane aphids, but with a more elongate body shape (Fig. 2). On the morning of May 17, 2018, we collected a number of winged M. f. cerealium using a sweep net in wheat plots on the Agricultural Research Center-Hays. 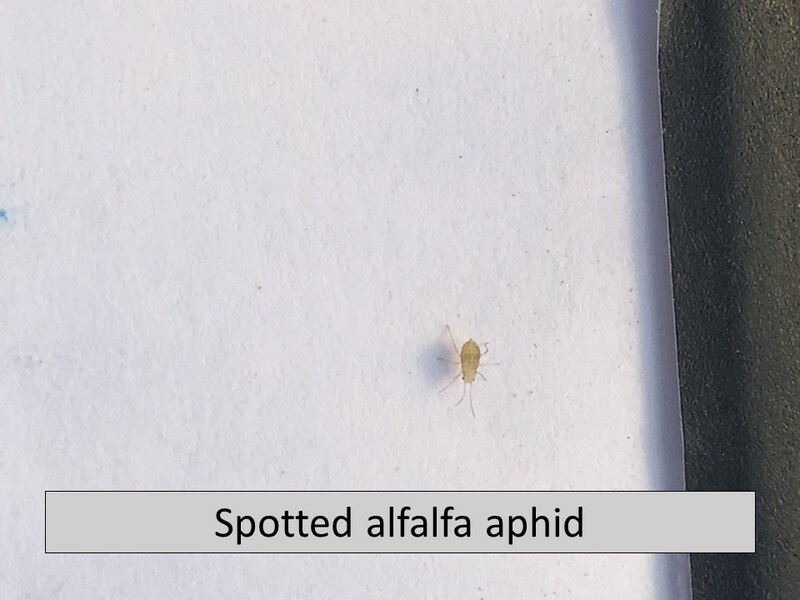 Other aphids present included Sitobion avenae and Rhopalosiphum padi, but all three species were present in low numbers, and were attended by the usual complex of aphid predators. It should also be noted that apterous M. f. cerealium were not found, so the winged forms are most likely very recent migrants. 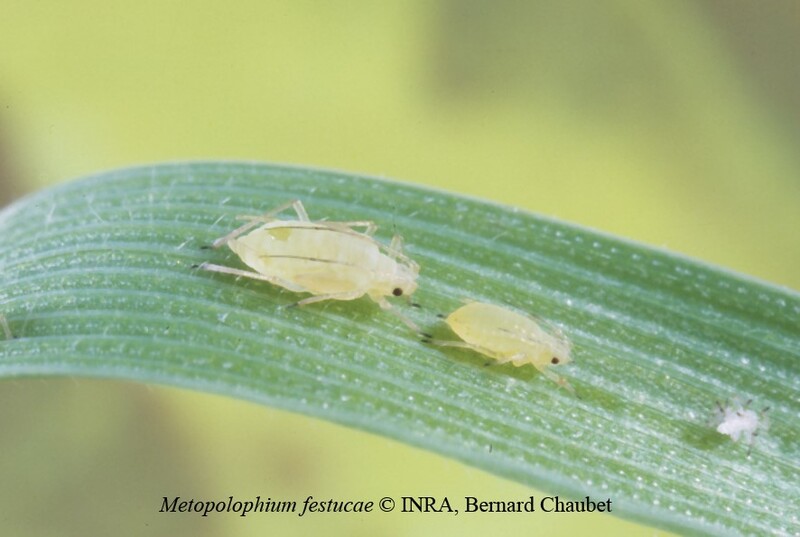 It is quite possible that existing biological controls will maintain this new aphid below economic levels along with all the other species present in wheat, but farmers should be vigilant for possible outbreaks in particular fields, especially later-maturing varieties that will give the aphids more time to feed and increase their numbers. It is also possible for these aphids to move to spring oats and barley after winter wheat matures. and overwinter on twigs (Figure 2). Eggs are laid underneath the body of adult females. In general, eggs hatch into red crawlers (nymphs) from May (RIGHT NOW) through June (Figure 3). The crawlers eventually find suitable locations and start feeding. 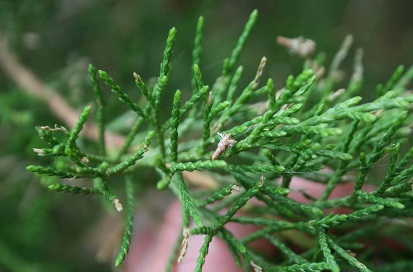 Crawlers can spread to other pines via wind currents or by attaching to birds. Females can produce up to 500 crawlers within a generation. Males, like most scale species, develop into winged individuals that fly and mate with females. Males do not feed and eventually die. In Kansas, there is typically one generation of pine tortoise scale per year. 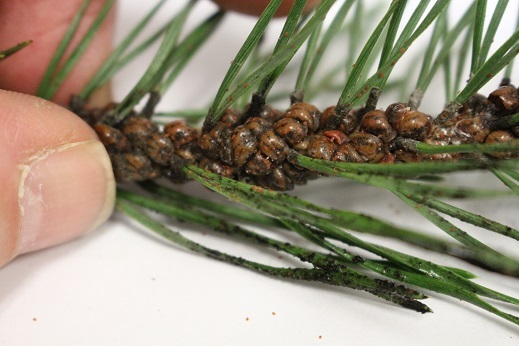 Pine tortoise scale feeding results in yellowing of needles, stunted needle growth, and under extensive populations can result in death of pines. Young pine trees, in general, are more susceptible to pine tortoise scale than older (mature) trees. In addition, foliage closer to the ground tends to support higher populations of pine tortoise scale than foliage higher in the tree canopy. Pine tortoise scale also produces copious amounts of honeydew, a clear sticky liquid that serves as a growing medium for black sooty mold. 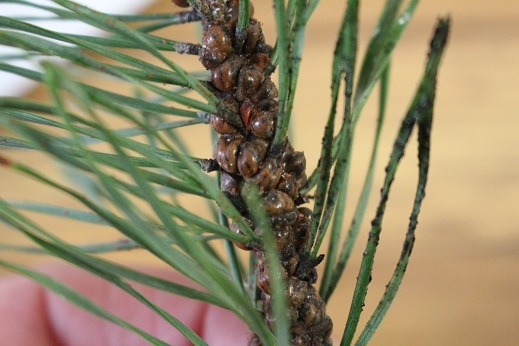 Entire pine trees may appear black from black sooty mold under heavy infestations of pine tortoise scale. A forceful water spray applied twice per week will quickly dislodge/remove the crawlers and mature females from infested pine trees. Insecticides that are useful in suppressing populations of pine tortoise scale crawlers include: acephate (Orthene), acetamiprid (TriStar), bifenthrin (Talstar), cyfluthrin (Tempo), dinotefuran (Safari), imidacloprid (Merit), insecticidal soap (potassium salts of fatty acids), and horticultural oils (petroleum, mineral or neem-based). 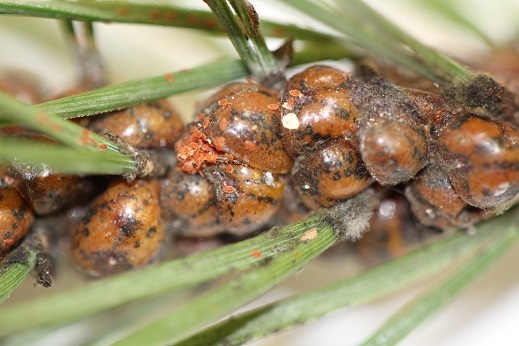 These insecticides must be applied when crawlers are active…which is RIGHT NOW…in order to obtain maximum suppression of pine tortoise scale populations and alleviate future problems. Bagworms: They Have Arrived….and Not From Outer Space! We have received notice from Jeff Otto (Wichita, KS) that bagworms, Thyridopteryx ephemeraeformis, are emerging from eggs, and the young caterpillars are out-and-about feeding on plants. Eventually bagworms will be present throughout the rest of Kansas feeding on both broadleaf and evergreen trees and shrubs. 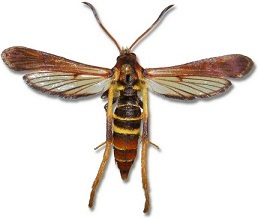 Therefore, now is the time to initiate action against this insect pest. Bagworms are primarily a pest of conifers but have expanded their host range to include a number of broadleaf plants, such as; rose, honeylocust, and flowering plum. Hand-picking small caterpillars (along with their accompanying bag) and placing them into a container of soapy water will kill them directly. This practice, if feasible, will quickly remove populations before they can cause substantial plant damage. For those not really interested in enjoying the nice hot weather and hand-picking, a number of insecticides are labeled for use against bagworms including those with the following active ingredients (trade name in parentheses): acephate (Orthene), Bacillus thuringiensis subsp. kurstaki (Dipel), cyfluthrin (Tempo), lambda-cyhalothrin (Scimitar), trichlorfon (Dylox), indoxacarb (Provaunt), chlorantraniliprole (Acelepryn), and spinosad (Conserve). Most of these active ingredients are commercially available and sold under various trade names or as generic products. Several insecticides, however, may not be directly available to homeowners. The key to managing bagworms with insecticides is to apply early and frequently enough to kill the highly susceptible young caterpillars that are feeding aggressively on plant foliage (Figure 1). Older caterpillars that develop later in the season are typically more difficult to kill with insecticides. Furthermore, females feed less as they prepare for reproduction, which reduces their susceptibility to spray applications and any residues. The bacterium Bacillus thuringiensis subsp. kurstaki (Figure 2) is active on young caterpillars but the active ingredient must be consumed or ingested to be effective. 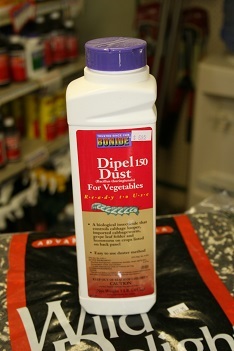 and Monterey Garden Insect Spray. The insecticide works by contact and ingestion (stomach poison); however, activity is greatest when ingested. 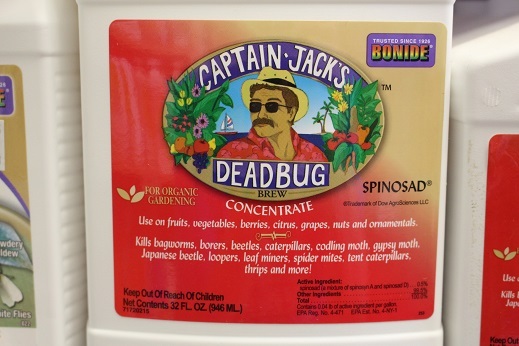 Products containing spinosad can be used against older or larger bagworm caterpillars later on in the season. Cyfluthrin, lambda-cyhalothrin, trichlorfon, chlorantraniliprole, and indoxacarb can be used against both the young and the older caterpillars. However, thorough coverage of all plant parts, especially the tops of trees and shrubs, where bagworms commonly start feeding, and frequent applications are essential in achieving sufficient suppression of bagworm populations. The reason multiple applications are needed is that bagworm eggs do not hatch simultaneously but hatch over a certain period of time depending on temperature, and young bagworms can ‘blow in’ (called ‘ballooning’) from neighboring plants on silken threads. If left unchecked, bagworms can cause significant damage and ruin the aesthetic quality of plants. 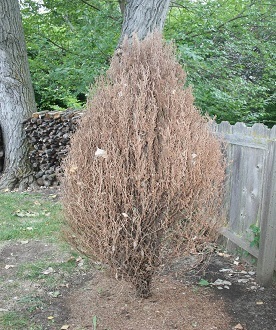 In addition, bagworms can actually kill plants, especially newly transplanted small evergreens, since evergreens do not usually produce another flush of growth (Figure 4). If you have any questions on how to deal with bagworms in your garden or landscape contact your county horticultural agent, or university-based or state extension entomologist. I want to acknowledge Jeff Otto as he has been very helpful in providing me information on the activity of insect and mite pests in south-central KS. If anyone is interested in helping me determine insect and mite pest activity throughout the growing season in KS please let me know. The larvae cause plant damage by creating tunnels and feeding within the bark (cambium). In addition, larvae can tunnel further into the wood and feed within the sapwood and heartwood. Larval feeding restricts the flow of water and nutrients resulting in shoot or branch dieback. Ash/lilac borer feeds primarily at the base of plant stems creating swollen areas or cracks, and where major branches attach to the trunk. 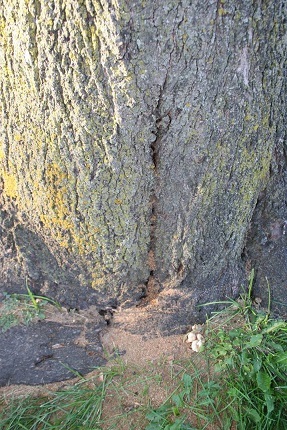 Evidence of larval feeding includes the presence of light-colored sawdust (frass) that accumulates at the base of infected trees or shrubs (Figure 2). Ash/lilac borer overwinters as a late-instar larva located in feeding tunnels or galleries. 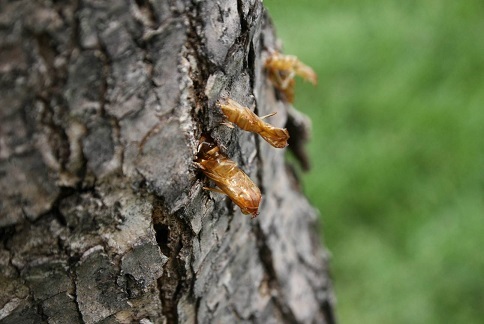 Trees or shrubs that have been infested with ash/lilac borers will have brown papery pupal cases protruding from the bark (Figure 3). These are where the adults emerged from. The best way to minimize problems with ash/lilac borer is to avoid ‘plant stress’ by providing proper cultural practices, such as; irrigation (watering), fertilization, pruning, and mulching. Stressed plants, in general, are more susceptible to attack than so called ‘healthy plants.’ A two to three foot wide mulched area around the base of trees and shrubs prevents injury from lawn mowers and weed-trimmers, which can girdle trees and shrubs thus leading to ‘stress.’ Furthermore, avoid pruning plants in late spring through early summer (under usual weather conditions) as this is when adults are typically present and the volatiles emitted from pruning cuts may attract adult females. Insecticides containing the active ingredients, permethrin or bifenthrin can be applied to the bark, at least up to six feet from the base, in order to prevent ash/lilac borer larvae from entering plants after eggs hatch. Ash/lilac borer larvae crawl on the bark searching for entry points, which exposes them to insecticide residues. Pheromone traps are commercially available that capture adult males (Figure 4), which helps to estimate when females will be laying eggs. 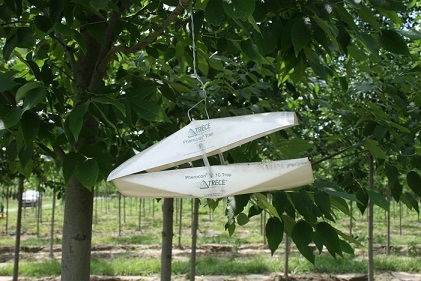 Pheromone traps help in timing insecticide applications. 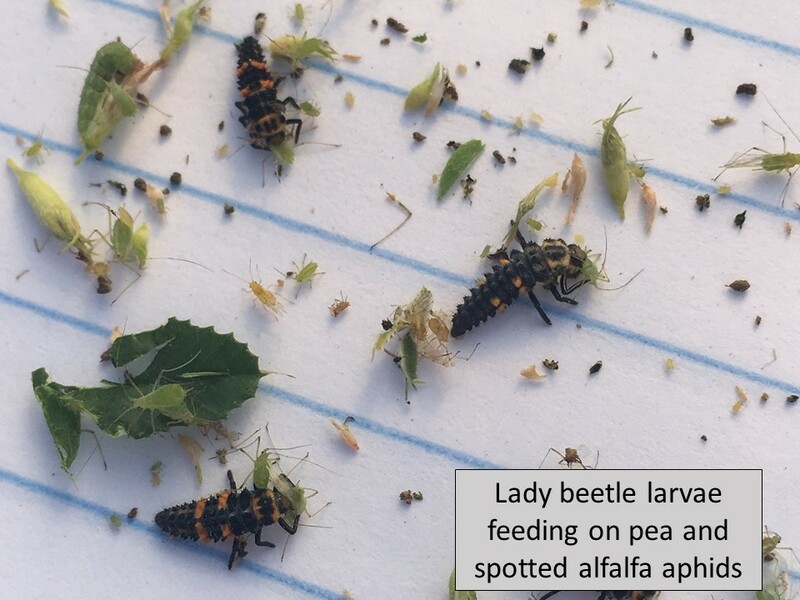 Insecticide spray applications should begin 7 to 10 days after capturing the first adults. Be sure to also check pheromone traps two to three times per week and record the number of newly captured adult males. For more information regarding ash/lilac borer management contact your county or state extension specialist.